What are they doing? Seriously, some one tell me. I mentioned that Fate converts the textures added at install from PNG to DDS. This conversion happens upon initial run of the game but also again if any of the converted textures go missing (which I use when I tweak textures and such). In addition to the main texture (or diffuse map), some textures had an alpha map (for transparency such as making the black on the sails below invisible). Then there are the “completemaps” that funk up the textures in game and honestly, aren’t very well done in Fate. Such as the one I posted last time. It was supposed to be a burned down building, but it looked completely black despite the original texture having detail and actual color. After I rebuilt the texture, it still looked dark in game. There was a peculiarity with the coloring and shading/highlighting with several of the textures. It was clear my changes were in place but something was distorting the image. You can see in the image that my version of the boat is much cleaner (and detailed). However, when I loaded the game, my textures showed but were muddied with blemishes shown in the first texture. I thought maybe it was an engine thing (e.g. 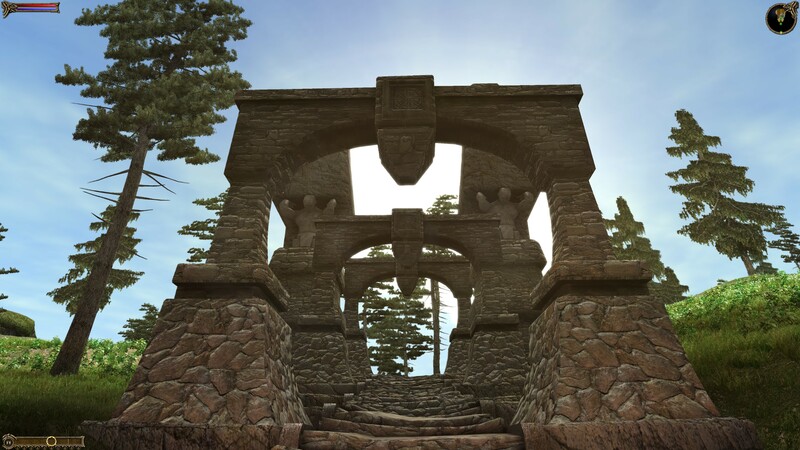 when building levels you can “paint” shadows and marks on the 3D landscape like Morrowind). Then I discovered, there was a third texture related to the boat image. However it’s structure is very weird. This texture does two things that I can discern: 1. highlights or darkens areas on the model and 2. adds color tinting. So my amateur status here doesn’t know what this layer is called or how the heck it is made or relates to the model. It’s not just another variant of the boat texture but rather more like a piecemeal palette of portions of the 3D model. The lighter the color is, the brighter on the boat and the darker creates shadows. The hue tints the image that color. But the mapping is crazy…I had to experiment just to get the white on the boat to be even. I plan to minimize my efforts on those files unless one (such as the boat) really needs it. The smelter (as it’s labeled in the filename) stays mostly red due to how it’s “completemap” is mostly shades of red. 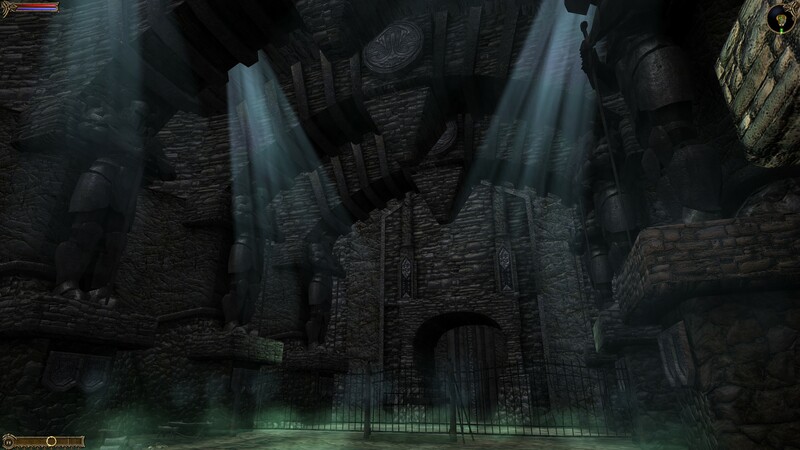 Smelter walls should be light brown. After some trials, I at least got the ship to a reasonable spot. I’m not sure if I’ll come back to Fate or not but it was a fun bit of messing around. This first picture shows the detail disparity between the building textures and most of the other ones. As I mentioned before, on a 4k monitor, most textures look really good for being such an old game. However, the buildings look like crap. I attribute this to them using the same size texture files despite the much larger size models…that and poor planning. I could, maybe, buy that it was for frame rate purposes: lower sized texture = less needed memory etc. However, that doesn’t explain why both Fate 2 and Fate 3 continued the same practice when the games by then hardly taxed computers. (NOTE: Both Fate 2 and Fate 3 have the areas from the previous games included). Even at lower resolutions, this blurriness is crap. So I tried to replace one texture with a high resolution one. I loaded it in Photoshop and found a semi-suitable replacement from online photos. For this mini-stone henge, I uses a hieroglyphic style from some ancient tablet. I don’t actually like this one that much any more but it did help with seeing the impact in game. First try failed. I changed the texture but in game, it had no effect. After trying a few things to see if I had the wrong format, I remembered that the game creates a cache file of the textures. Why? I know what it does, but I have no reasonable explanation on why they chose that method. What was the gain over just using the PNG files? All the textures that get installed with the game are in PNG format. Easy to edit so that wasn’t a problem. When first running the game, it creates a cache of the textures CONVERTED to DDS format and stores that cache in a folder in the ‘Program data’ (usually on the C drive.) You can either edit the DDS directly (it’s another image format), or edit the PNGs, convert and then delete the conversion if you need more work. Believe it or not, I chose the latter. DDS files are what is known as “lossy” (loose detail as you save and compress them) and I rather have the masters in PNG files. It doesn’t really make sense because if I released this, I would use the DDS files but I feel it somehow keeps me more orderly. Occasionally, I like to test out games on my 4k monitor to see how they look at such a high resolution (3184×2160). For some games, that impact is less than you would expect while others look surprising good. For example, Bethesda Gamebyro engine-based games (Elder Scrolls and Fallout) look a little better but I’m not very wow’d by it. I think it boils down to the engine and lower resolution textures. Less aliasing (jagged edges around the 3D model) and more detail but not the punch you would expect. On the other hand, Two Worlds looks fantastic. The textures are high resolution enough to make them really pop. Unfortunately, the interface doesn’t scale so it’s very “difficult” to play at such a high resolution. Visually, it’s very pleasing though. So one day, I got a bug to try the old game Fate. It was the predecessor to Torchlight. A top-down action-RPG click fest. My boys played all but last one in the series so as usual, there is a touch of nostalgia for me. The only thing I had to figure out tech-wise was how to get the resolution desired in game. Some games work out of the box and some require manually editing “ini” text files. In this case, I had to edit the “ini” file AND disable scaling on high DPI settings. I did that by right clicking the program executable file and putting a check under that line in the compatibility tab. Viola…4K work for a decade+ old game. You can see in the screenshot (even if you don’t have a 4K monitor) that the character models are actually quite detailed. In 4K, they really stand out and don’t really need any work. Well, I could do a little but I digress…in general, they are perfectly nice. However, as you can see in the “snow/ice” texture, the non-character models are blurry low-resolution messes. Basically, they are tiled 128×128 textures. They are so dramatically worse than the character/object textures in 4K. The building are also very low resolution…which is even more boggling since they don’t blend into the background like the landscaping. That is when I got inspired…to fix the disparity. The above (partially complete) picture is post landscape editing. For the record, I’m still not crazy happy about it but small steps.The landscapes textures have revealed the oddites of the engine. A few places where they don’t actually blend and such but not too much. The real work and most dramatic change was the building and landscape objects…but that is for next time. This is Jiub. Jiub is the first person you see in Morrowind. He also has a fairly unique head so it was fitting to use him as my first experiment. Easy to test. This Jiub, being my first attempt, is a little crude compared to the later images. The transition as I refined the style is apparent. So here’s what I did. The initial resolution was 256 x 128 pixels. That’s not a lot of room for sharp lines and clarity. Additionally, it’s a good idea to work big and then shrink as needed so I resized the image to 2048 x 1024, keeping the aspect ratio but increasing the size by 8 times. As the fine lines of the borderland style are important, a higher resolution is preferable. (I tested it when done and shrinking down to 512 x 256 looked OK but 1026 x 512 was ideal for size vs detail). I duplicated the image into two additional layers. I do this so I can have a pristine backup, a working copy and high pass copy (if needed). The high pass allows me to see the areas needing outlines more clearly. I don’t always use it but it’s handy if needed. I created a new layer that is transparent to be my actual canvas for the black outlining. Showing but underneath the active layer would be the working copy or the highpass copy to use as the base reference. Like the video linked in my last post, I started creating outlines highlighting particular feature areas that stood out for change in shape. My variation on this style leans more to outlining surfaces with changes in height but not color fluctuations (e.g. later on when I get to tattoos, I likely won’t outline the tattoo.) I looked for distinctive wrinkles and natural feature as well as abrupt marks like the scar. As you can see in Jiub 1.0, I failed to refine the lines after I finished outlining. I didn’t use shape dynamics or taper and thin out the lines. Crosshatching was also minimal. I used a program called NifSkope that lets you see meshes rendered with textures and animation if applicable. It was there that I saw how odd the texture stretched due to the 3d model’s crude animation and UV texture mapping. The eyes looked really weird as the mesh just stretched down a single point to mimic blinking but the texture stretched the area above the eye down with it. The mouth opened up very much like the canadians in South Park. Because of that, I had to go back and adjust the lines to minimize the line bleeding when the textures stretched. You can also see where the original texture has errors such as the red eye’s inner lower corner bleeding onto the eyelid. Because this is a more cartoon-like look, I experimented with using an unsharpen filter on the working copy of the original image to exaggerate the colors and then a smart blur to blend the blemishes away some. Additionally, I added shadows and highlights by drawing on a new layer black and white respectively at 50% opacity and then blurring it to look like light smudging. Next time, I show the other, more refined textures I completed AND Jiub 2.0. Since I have limited time to focus on leisurely activities, a lot of what I do with game art falls more into the “Proof of Concept” category. I have an idea about what would be a interesting visual change for me and I merely want to see it in game. For example, for the Darkstone project, I was going for the look of dry erase crayons on a dark dry erase board. 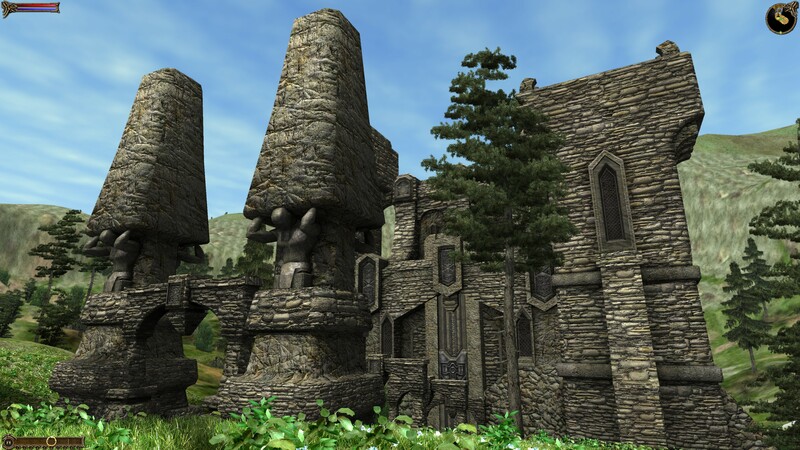 For Morrowind, I simulated a cell shader (cartoon) effect with build in black outlines. Note: when I first made those textures, Borderlands hadn’t been released. However, I had already realized that it looked better to have the solid colors have some kind of texture behind them for visual interest. I was messing around with my new art tablet last month and decided to see if I could replicate the style of Borderlands in Morrowind, at least as a proof of concept. I did some research for tips on the best way to replicate the effect and found a youtube video that explained a method that a got very close to the games style. I chose to experiment on the vanilla Morrowind face textures. In general, they are awful and look very ugly in game. My logic being that adding the “borderlands” style texturing might add enough interest to make them worthy of keeping versus using model replacer mod (may mods replace the heads). The original textures used for faces were very low resolution, inaccurate (sloppily made) and just generals ugly as all get out. I started by doing the heads in the order of the characters you run into when you start a new game. I redid 5 faces. It was surprisingly easier than I thought. I’ll detail it out next time but for a teaser here’s what “vanilla” jiub looked like when I was done. I’ll explain the irregularities next time. Tech Nerd Note: Years ago when I built my computer, I bought a CPU chip (I7-2600K) that was designed to be overclocked but I never bothered since it was already (and still is) very capable. I finally gave it a go and ended up boosting the speed from 3.4 Ghz to 4.4Ghz (about 25% more power) with very little change in temperature. All I had to do was change two settings in the BIOS and voila…instant faster computer. 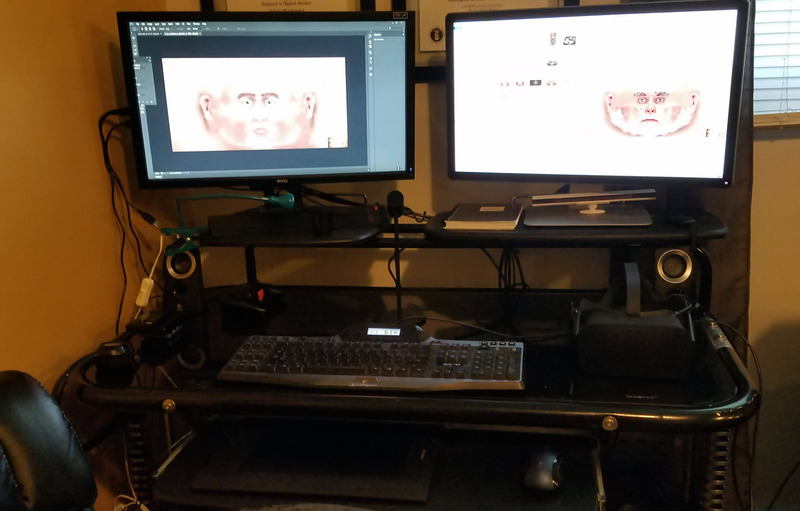 I also upgraded my computer desk and arranged my setup so it’s much more aesthetically appealing and has space for using the Oculus Rift. I did find time to play with my new tablet though. I took its arrival as a cue to make the transition over to Photoshop from GIMP. I do have to say, it’s has taken a few weeks for me to adjust to how different it is. I feel like I have taken two steps back but I know I will catch up to speed pretty quickly. I just have to do a little more “google research” to figure out how to do things than I did with GIMP in a long time. Now that I had my new art tablet, I really wanted to see what it could do and clicking individual pixels for the Arena Depixelization Project wasn’t going to scratch that itch (sorry it’ll be back on the agenda soon). I’m not sure if I mentioned this, but my favorite video game of all time is The Elder Scrolls: Morrowind. Atmospherically, it’s an amazing setting. However, it’s from early 2000s and a little clunky. The 3d models of the characters are blocky like those poseable wooden art figures (composed of multiple seperate 3D meshes). The textures are low res, blurry, and sometimes quite questionable in their construction. As can be seen in my Morrowind screenshot directory, I have experimented with that game before.